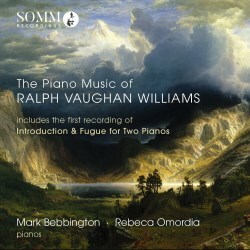 All concerned with this ambitious and enterprising CD are to be congratulated especially on including the first recording of Vaughan Williams’ Introduction and Fugue for two pianos. Mark Bebbington informs that this substantial work was dedicated to Phyllis Sellick and Cyril Smith (the husband and wife piano duo). They acknowledged the dedication and played it a few times but felt they had to drop it because they found it difficult to programme – audiences preferred more approachable fare and so the work languished undiscovered in collections and libraries from the 1940s until recently. About eighteen months ago (as I write in February 2017) Phyllis Sellick gave Mark Bebbington her copy of the work complete with Vaughan Williams’ metronome suggestions and dynamic shadings. SOMM were supportive – so too was The Vaughan Williams Charitable Trust.